For even the most enthusiastic of eaters, the tomahawk at Star King BBQ in Koreatown is a formidable feast. 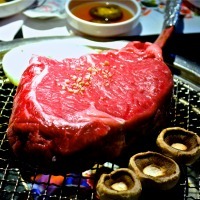 The bone-in rib steak—the entire length of rib bone intact and frenched Flintstone-style—is a rarely seen beast in L.A. Over two pounds of meat, peaking at two-inches thick, the tomahawk can easily feed two to four people―or one very ambitious eater. The tomahawk’s girth requires that a staff member grill the meat tableside. The chop is grilled over a mesh screen which is placed several inches over high-heat, smokeless charcoal. Simply seasoned with chunky bits of sea salt, each side of the hefty steak requires about seven minutes to properly sear and caramelize. After that, it rests off the heat, is sliced thick, and is then returned to diners. Some opt to cook the meat further on tabletop grills; others enjoy it rare. Korean barbecue with Piedmontese beef? There’s nothing like it. It’s worlds away from your every day KBBQ.